The Martyrs Agathonicus, Zotikos, Theoprepius (in Slavonic: Bogolep), Akyndinos, Severian, Zinon and others accepted death for Christ during the reign of the emperor Maximian (284-305). The Martyr Agathonicus was descended from the illustrious lineage of the Hypasians, and he lived at Nicomedia. Having become well versed in Holy Scripture, he converted many pagans to Christ, in which number was also the most eminent member of the Senate (its “princeps” or leader). 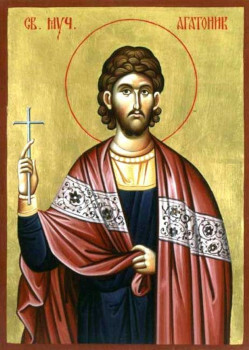 Comitus Eutolmius was sent to the Pontine (lower Black Sea) region, where he crucified the followers of the Christian Zotikos, all who had refused to offer sacrifice to idols, but Zotikos himself he took with him. In Nicomedia Eutolmius arrested the Martyr Agathonicus (together with the princeps), and also Theoprepius, Akyndinos and Severian. After tortures, Eutolmius ordered that the martyrs be taken to Thrace for trial by the emperor. But along the way, in the vicinity of Potama, he put to death the Martyrs Zotikos, Theoprepius and Akyndinos, who were unable to proceed further behind the chariot of the governor because of wounds received during the time of torture. The Martyr Severian was put to death at Chalcedon, and the Martyr Agathonicus together with others was beheaded with the sword by order of the emperor, in Selymbria. The relics of the Martyr Agathonicus within a church named for him was seen at Constantinople in the year 1200 by the Russian pilgrim Antonii. And in the Fourteenth Century Philotheos, the archbishop of Selymbria, devoted a discourse of laudation to the Martyr Agathonicus.